Many of us including me are a great fan of saucy chicken recipes. Chicken!!! the great yummy blessing to mankind from God. I can hardly go a day without eating some scrumptious chicken dishes. Like Chinese chicken dishes, i love having chicken recipes with sauce. Its really fun to browse through shopping malls especially in food section searching for wide varieties of scrumptious eats. Haah...lets come to the recipe ...While preparing sauce recipes for chicken, just mix the sauces together in a bowl very well before adding the chicken in sauce. This is a simple recipe for chicken with sauce. As the name suggests, its saucy and easy. More over this is a mess free recipe as i spent hours for cleaning my kitchen in some days. You can try the same recipe with vegetables of your choice for a quick chicken and vegetable recipes. 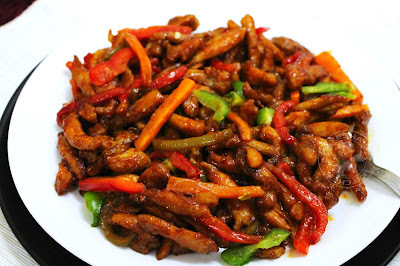 Here is the recipe showing how to make saucy chicken recipe / Chinese chicken dishes /Chicken dinner recipes / Chicken with sauce / strips chicken/ chicken stripes /easy recipes for chicken breast/ saucy chicken breast recipes. Do try this juicy saucy spicy chicken dish . You can use red chili sauce instead of Kashmir chili powder. Cut the boneless chicken (preferably chicken breast) into thin chicken strips or slices. 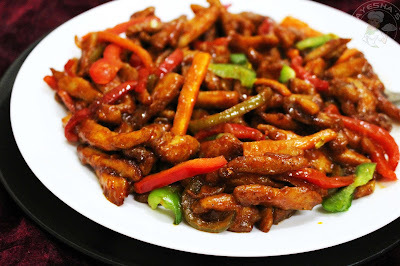 Also, cut the bell peppers and carrot into thin slices same like chicken strips. Set aside. Make a fine paste of garlic cloves, fennel seeds, curd and soy sauce. Then marinate the washed thin stripped chicken with this paste along with cornflour and pepper powder. Add less salt than required as we have to saute the chicken in a saucy gravy after frying. Now heat a non-stick frying pan (i prefer this) with required oil for deep frying the strips. Deep fry the marinated stripped chicken in batches until the chicken is done. Do not fry the chicken more crispy. When done, set aside on a paper towel to get rid of the excess oil. Meanwhile, take a bowl and mix well all the ingredients given under 'for the sauce' heading along with little salt (do not add more). Make a thick sauce. You can add more or less sauce as per your taste. Now heat another pan with butter. To this add finely chopped garlic, saute for a minute. Then add the thinly sliced bell pepper and carrot. Saute for few minutes until it became soft. And now add the fried chicken strips along with the sauce mixture. Saute it continuously very well over a medium low flame. Check for salt. Cook until the fried stripped chicken is well coated with the sauce mixture. Garnish with sliced bell peppers and serve hot. Yummilicious side dish which goes well with fried rice, chapati, or any special rice recipes. This dish tastes heavenly delicious when it is served hot. Do try and please drop your valuable feedback in the comment box below.